Stoney Creek: 365 days a year, we're here for your heating, cooling, plumbing needs and more. In Stoney Creek and all around from Ancaster to Niagara, when you need to make sure your home is as comfortable as it needs to be, the Reliance™ team in Stoney Creek has you covered. Our friendly call support team is at your service around the clock to handle any issues you have about your heating, cooling or plumbing concerns. And when you book an appointment with our installers and technicians, you can also rely on a courteous visit to your home from professionals who are licensed and continually trained so that you always get what you expect – and more. Whatever your home's comfort needs, you'll never be disappointed by our Reliance team in Stoney Creek. We're always here for you – so please give us a call or book an appointment on your website with a few convenient clicks! Hi, I'm Stephen and I'm the Sales Manager for Reliance in Hamilton. I love being part of a team that is so focused on providing customers with an exceptional customer experience, backed by quality products and services. The culture here is exceptional and I work with extraordinary people are teaching me something new every day. When I'm not supporting my team and Reliance customers, I love spending time with friends and family in Hamilton, as well as running and staying active. My name is Jayson and I'm a Home Comfort Advisor for Reliance in Hamilton. I love my job – it's a new challenge every day and I enjoy the opportunity to problem solve and think quickly on my feet. I really also relish answering customers' questions and breaking down the value of what we have to offer. Working with the Reliance team is also amazing. The company culture is second to none. I've been here for four years and I've truly enjoyed it. When I'm not with my Reliance family, I love travelling and spending time with my own family and friends, as well as studying health and fitness. Hello, there. I'm Jeff and I'm a Reliance Home Comfort Advisor in Hamilton. What do I love most about my job? That has to be meeting people, discovering their needs and providing them with the best possible home comfort solutions. As for Reliance, it's a great place to work and grow and it's provided me with the best opportunities to do what I enjoy doing most. And when I'm not providing Reliance customers with the best service I can, I love spending time with my grandchildren and relaxing at the cottage. Simon's my name and I'm a Reliance Home Comfort Advisor in Hamilton. I really like my job because I get to help people where I leave and meet new people in the community every day. My number one objective is to provide exceptional customer experience. I also like that Reliance stands by its work and goes above and beyond to guarantee everything we do. When I'm off from work, I love hockey, history and military strategy games. Hi, I'm Jason and I'm a Reliance Home Comfort Advisor. My goal with every customer is to spend the time that's needed to make sure I can help find the best possible home comfort solutions. What I really like about my work is meeting new people and helping them meet their needs, no matter the situation. It's also great that I can use my background as a gas fitter to help many customers find the appropriate solution. When I'm not here with my Reliance family, I spend time with my own, as well as camping and youth sport volunteering. I'm Amy and what I enjoy most about being a Home Comfort Advisor is the opportunity to meet interesting people and hear their stories. I love being there for customers and helping their find total satisfaction from the great products and services Reliance provides. In my free time, I love bowling and travelling. My name is Scott and as a Home Comfort Advisor, I really enjoy finding tailor-made solutions for each customer's needs. Each day is different and I love to meet new people and find solutions that make them more comfortable and improve their home's efficiency. When I'm off from work, I enjoy spending time with my family, travelling and playing golf. Hi, I'm Ann. I'm a Home Comfort Advisor and I love working for a company that puts people first, whether it's customers or team members. I feel valued and supported and I try to make sure my customers feel the same way. One of the best parts of my job is hearing the words "thank you so much for making our decision so easy and for taking the time to understand what's important to us." It's really gratifying to know that you're doing something to help the well-being of people in your community. I love the outdoors and when I'm not working, I love surfing, yoga, health and wellness and helping the earth – the one home we all should feel comfortable in. We are proud to serve the Hamilton and Niagara areas and support the community we live and work in. We strongly support the United Way and Habitat for Humanity. In fact, Reliance team members have rolled up their sleeves, put on hard hats and safety shoes to hammer nails and paint walls, so that deserving families can afford a comfortable home. Watch the video to see Reliance team members at work for Habitat for Humanity. We also love to see kids being active in their favourite sports and pastimes, which is why we’re happy to sponsor your little league sports teams – contact us for more information! Reliance Stoney Creek team members take part in various initiatives in support of United Way’s including volunteering as part of their Day of Caring campaigns. In 2016, team members showed their support and volunteered at a local soup kitchen and were involved in food preparation and stocking shelves. 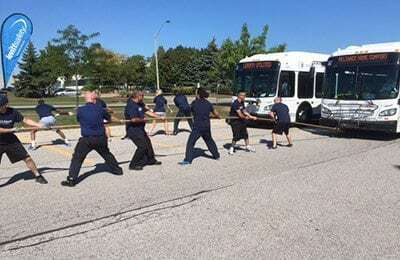 In an unparalleled display of shear power, eight of our team members pulled a city bus to near victory at the Oakville United Way Bus Pull in support of United Way. It was a fun way to raise money for a great cause. 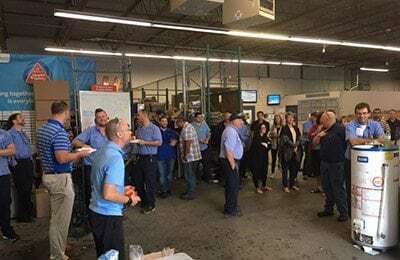 Our annual BBQ is a perfect time to give our team the opportunity to donate via payroll deductions and Reliance matches every dollar – doubling the impact of funds raised. One in three families in our communities benefit from the agencies supported by the United way so we know it’s important to give generously! "Today my husband and I spent over two hours with Dean Timpany. We just discovered that we needed a new furnace and air conditioner. We tried to turn our air on during our heat wave and it did not work. I called Reliance and they came within a couple of days. Kyle the service guy said that one of our wires were bare and there probably causing a short. Within the hour Dean arrived. My husband is a real tough sell. Dean was very patient and answered all his questions. I was very impress with all that Dean had said. It certainly made sense to rent the units instead of buying them. I would certainly recommend this service to anyone that requires the service Reliance provides. I am looking forward to getting my new furnace and air conditioner." "Ann Robillard called us to advise new models of ductless AC are here. Installation occurred quickly some servicing required but reliance handled that quickly. Reliance has the friendliest ppl from sales to installation crew to service techs (Larry) and they offer great customer service! That's why I call them! Thanks reliance!" "We were very happy with the service Shawn L. from Reliance provided. He was very helpful, efficient, and explained all of the questions that we had."